He originated from19th century Bulldogs (used for the bloody sport of bull baiting) crossed with various terrier dog breeds. The early crosses between these Bulldogs and Terriers were called Bull-and-Terrier dogs and in England became known as Staffordshire Bull Terriers. 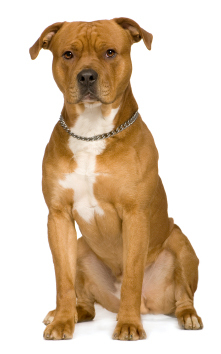 When these dogs came to America in 1870 they were known as Pit Dogs or Pit Bull Terriers. Later they became known as American Bull Terriers and Yankee Terriers. In the United States breeders bred these dogs to be larger than the English versions making them into a distinct breed that is today called the: "American Staffordshire Terrier."